That was the theme of the day at Kade's school. (It seems like I have more to report on him. I guess it's because he's with me more and his school does more fun things.) Kade started out in his Star Wars jammies but I noticed they were about 3" too short and the shirt just barely covered that pot belly of his. I talked him into his Scooby-Doo ones that fit better. He took his Citrus Dragon with him to share the day. I helped out with the event. (I didn't end up doing much, filling cups for the kids and taking pictures of everyone.) The day was a success. 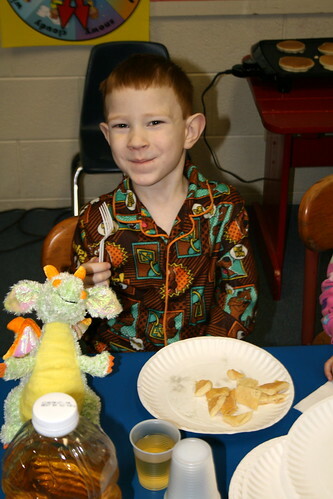 The kids all had fun eating breakfast and wearing jammies at school. Those pancakes in the background look scrumptious!